This exquisite and secluded waterfront property on 4.5 acres is minutes from the historic Gay Head cliffs and lighthouse and features a private path to a quiet beach. The house is spacious and modern, with 4 bedrooms opening onto large decks overlooking the water with a full view of the Elizabeth Islands, Vineyard Sound and spectacular sunsets, and a fifth bedroom with one twin bed. The large kitchen is fully equipped and the dining area comfortably seats 12. The private tennis court is shared by four families. 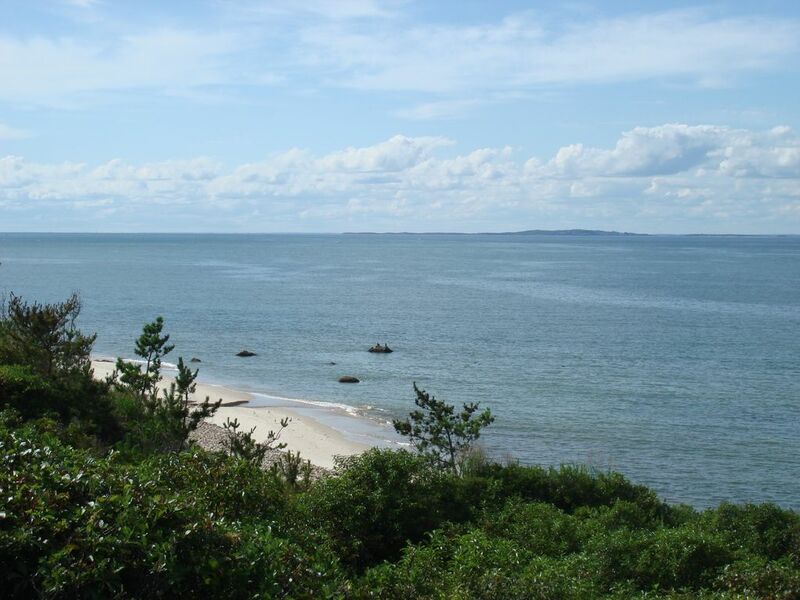 The house is minutes away from the beautiful Philbin Beach, and from Menemsha Pond, which is ideal for clamming, sailing, and safe for toddlers and small children who delight in exploring its warm shallow water. After spending their honeymoon on Martha's Vineyard in 1956 and falling in love with the island (in addition to each other), my parents rented various homes in Chilmark for many years. In 1968, they bought land in Aquinnah (known as Gay Head back then) together with 3 other families. They built the house, and it has been renovated and updated a number of times since then. It is a very special place. There is nothing better than sitting on the deck in the early evening, watching the sun set over the water - especially after a day at the beach, a bike ride to Menemsha via the bike ferry, a walk around the cliffs to the ocean side, or a trip to town. It could not be more relaxing and rejuvenating. Private beach in front of house. Access to Philbin Beach. The ocean is about a 20 minute walk on the beach, around the base of the amazing clay cliffs, or a 5 minute drive to the town's Philbin Beach. House is on a dune overlooking Vineyard Sound. Short walk to beach. Vineyard Sound, looking across to the Elizabeth Islands. Very large, very high-ceiling, with tons of light and the most spectacular views of Vineyard Sound and the Elizabeth Islands. The sun sets right over the water - could not be more beautiful! Watch the sunset over the sound while you dine. Large flat screen TV in TV room, 2nd flat screen TV in Bedroom 3. Xfinity Super Triple Play, with Internet throughout the house. Very eclectic and interesting library. Scrabble, jigsaw puzzles, playing cards, and a variety of other board games. Markers and crayons, also. Boogie board, skim board. Use at your own risk. Private court shared with 3 other families. Guaranteed 2-4 hours of court time per day, often more! Wireless Internet is accessible throughout the home and premium cable is available on two flat screen television sets. Both TVs have a DVD. 1 TV is in the TV room, between the kitchen and Master BR, the other TV is in Bedroom #3. CD/MP3 player in the living room. Outdoor seating overlooking the water/sunsets, as well as on the deck in the front of the house. Spacious outdoor shower. The house exceeded all expectations. If you are looking to unplug and relax you will not be disappointed. Extremely well equipped, comfortable beds, tremendous water views and the sounds of the waves putting you to sleep this fits the bill. We are so glad you enjoyed your stay! As you discovered, early September is a wonderful time to be on the island. We hope you will come back! Excellent location. Spectacular views. Great water access. Well-appointed home with quality furnishings. Loved this home: light-filled, beach-front, quiet, comfortable, gorgeous location! Our family loved our stay at this beach-front, quiet home. The house was light-filled and comfortable with beautiful bedrooms, a spacious family room, vaulted ceilings, multiple decks, and gorgeous views from every room. We loved the peaceful Aquinnah location. We walked and fished along the beach and even enjoyed the scenic drive to Edgartown every day. We saw lots of birds, deer, rabbits and even a seal and some turkeys nearby. We were walking distance to the tennis court across the road. Fantastic family vacation location for all ages. The owners were wonderful and accessible and provided lots of helpful information. Dogs are allowed so we will definitely bring them with us next time. We hope to return again soon! We are so glad you enjoyed your stay! We will look forward to your return next summer. The house was great and had everything we needed. We walked the beach in both directions each day. The sunsets were to die for and Judy was a dream to work with. All and all a great place to call home on vacation! Truly Magical! Private Gem on the Water! Wonderful property! We spent 10 days here in Oct & shared the house with several couples. We picked this spot because it is on the remote end of the island with less crowds & traffic. The house is clean & the bedrooms are very spacious. The kitchen is completely functional & has everything you need. Bring/buy your food , grill/cook & take in the amazing views from the large dining room table. Lots of space in this house! We made occasional runs to the Menemsha fish markets for fresh fare (about a 15 minute drive from the house). The house location is very secluded, private & dramatic. A wide back deck affords glorious views the Vineyard Sound & Elizabeth Islands. Step off the deck, walk 30 seconds down a path & arrive at the beach staircase. Below the stairs is a beautiful rocky beach & prime, outstanding fishing. We caught stripers & bluefish directly below the house, especially around sunset. If you want to swim, walk a few minutes right to Dog Fish Bar where it is very sandy. This location showcases nature at its best! From both the deck & the beach, we spotted large seals swimming parallel to shore about 75 yards away - a special treat! The seals were curious & looking at us when they came up for air. Great bird watching too. We hiked along the beach, turning left from the stairs, past the dramatic Aquinnah cliffs to Aquinnah beach, up the paths & back home along the road. This is a wonderful 4-ish mile loop that you won't want to miss - best to walk it at low tide. We absolutely LOVED our stay & can't wait to plan a return visit! We are so glad you enjoyed your stay, Maire. You are welcome back any time! Probably one of the finest houses in Aquinnah. The owner was very nice and made sure we had everything we needed. In every part of the house you can see directly the sea!!! The beach is close, with a beautiful staircase that descends on the beach exactly halfway between the rocky shore of Gay Head and the sandy beach of Dog Fish Bar. The house is spacious and comfortable, equipped with everything you need. I will definitely return !! This secluded property is just minutes from the Gay Head Lighthouse and clay cliffs, Menemsha Pond, and the Atlantic Ocean. The picturesque and historic fishing village of Menemsha is less than 15 minutes away with local fresh seafood. Quaint and well stocked public libraries are in Chilmark and Aquinnah. Shopping, restaurants and movie theaters are readily accessible in all the down island towns just 30 minutes away. Island-wide bus service is available. PLEASE NOTE: Rates are seasonal and vary by week/month. Please inquire about particular days/weeks. Rates are subject to change until reservation is confirmed.